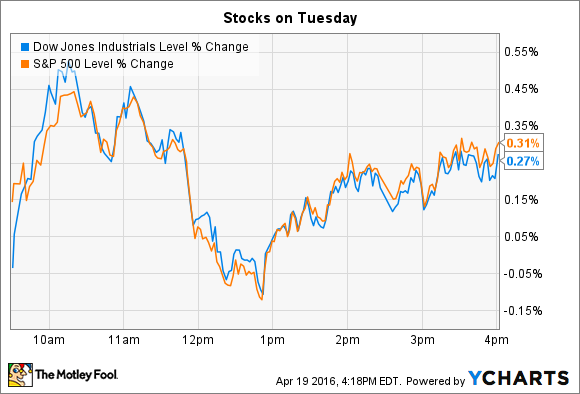 Why these two stocks fell hard on Tuesday. Major individual stock moves included Netflix (NASDAQ:NFLX) and Illumina (NASDAQ:ILMN), which both fell by double digits after posting first-quarter earnings results. Netflix shares lost 12% after the company announced its best quarter yet of subscriber growth. The streaming video specialist added 6.7 million new members -- including 4.5 million from international markets -- to pass 81 million global subscribers. That trounced management's January guidance (calling for 6.1 million net additions), and executives credited exclusive show launches like Making a Murderer, Fuller House, and the fourth season of House of Cards for the surprise. "Our forecast for the quarter was low because we underestimated the impact of our major original content debuts," CEO Reed Hastings explained in a letter to shareholders. The streamer's forecast for Q2 growth wasn't as aggressive, though, and drove the pessimism in the market. Netflix's finances deteriorated thanks to the twin challenges of ramping up marketing spending in 130 new territories while at the same time investing in cash-heavy exclusive content productions. Overall operating margin fell to 3% from 6% a year ago, and the company sees that figure slipping to 2% next quarter. Cash flow was solidly negative as well, keeping Netflix on pace to burn through about $1 billion this year. Executives see that cash loss as an investment that will pay huge dividends over time as Netflix matures into a global business, with as much as 80% of revenue coming from outside of the U.S., compared to less than 40% today. "We have lots of work to do to make Netflix more relevant market by market, but the opportunity is amazing," Hastings said. Illumina, which produces DNA sequencing technology, was the worst-performing stock on the S&P 500. Shares dove 24% after the company issued surprisingly weak preliminary results for its upcoming quarterly report. Q1 revenue will likely rise just 6% to $572 million, marking a significant deceleration from the prior quarter's 15% boost. Illumina sequencing machines. Image source: Illumina. A few key products failed to find the early traction management had predicted. "Our first quarter results fell short of expectations largely due to lower than expected sales of HiSeq 2500, 3000 and 4000 instruments," CEO Jay Flatley explained in a press release. This weakness was most pronounced in Illumina's European markets. Consequently, while the company believes its other geographic regions will perform at the healthy growth pace it predicted in early February, Europe will not. In fact, the slowdown in that key market convinced executives to dial back their overall growth forecast to 12%, compared to the 19% gain it booked last year and the 16% rise Flatley and his team initially predicted back in February. "Given the disappointing outlook in Europe, we have made management changes in the region and plan to implement a program of actions to achieve our goal of delivering the robust growth we believe the market can support," Flatley said. Investors will get more details on that plan and on the company's profitability outlook when Illumina posts its full, audited financial results on May 3.